FXpansion recently introduced BFD3, the third version of its comprehensive drums software. A simple revision or a true update deserving a new version number? And what is its place in a universe already overcrowded? Let's find out. The virtual reproduction of drums has had a very special place in the history of sound synthesis and sampling. We won't go over the history of the drum machine, because one article wouldn't be enough. 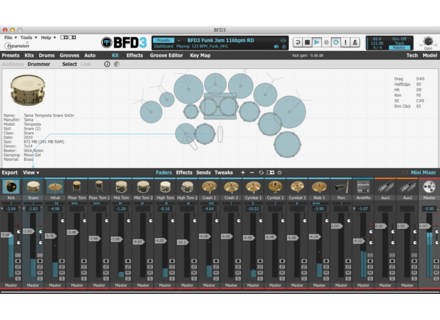 Instead, we'll take a look at the evolution of BFD, the virtual drums software created by FXpansion. The latter, after having started with plug-in format adapters (specially VST-DX Adapter, their lucky charm, in 1999) created two drum machines, the DR-005 and the DR-008, which offered some very nice features when they came out. In the early 2000's, the options to work in depth with grooves (not considering hardware drum machines) were not many. Some publishers (Discrete Drums, Reel Drums and Zero-G) offered solutions based on multitrack audio, but with very limited processing options. Other publishers offered detailed kits, occasionally with loops, like Drumkit From Hell (which evolved into DFH Superior and its follow-ups, one of BFD's greatest rivals) and Wizoo with MixTended Drums. Then Steinberg started a small revolution with Groove Agent, a drum sample player with MIDI grooves. In 2004, FXpansion presented its proposal for an integral software: BFD, the first of its kin. It included lots of sounds recorded in four different ways (Direct, Overhead, Room ans PZM), numerous options to process the different elements of a kit, separate outputs, and a rhythm library, all within a very neat interface for the standards at the time. Gradually, the publisher started to bring out compatible sample libraries, introduced version 2 of its software and started to get heat from all fronts (non-exhaustive list) by direct competitors like Toontrak's Superior Drummer 2 and EZ Drummer, Cakewalk's Virtual Drums, all Native's Abbey Road Drummer for Kontakt and compatible libraries (Steven Slate, etc. ), Steinberg's Scarbee Imperial Drums XL for HALion, XLN Audio's Addictive Drums, Arturia's Spark, Rayzoon's Jamstix3, Avid's Strike; but also from indirect ones in the form of software integrated in DAWs (as factory defaults or as an additional option), like Logic Pro X's Drummer. So, what are the changes and virtues of this new version? First novelty: following in the steps of most software publishers, it no longer has an installation CD/DVD, but rather offers the possibility to download it or receive it per mail on a USB key, the only physical option remaining. 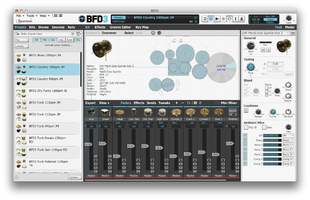 Regardless of the format (download or USB key), BFD3 costs the same $349. An upgrade is also available ($149 for the online version and $50 more for the physical one). In case we opt for the USB key, we also get the links to download the software so that we don't have to wait for the key to arrive, thank you FXpansion. For this review we chose the download, which is done in two stages: we first had to download the installer of the software itself (available as a standalone application and as a plug-in the following formats: RTAS, AAX, VST and Audio Unit, in 32 and 64 bits), and then a "download ticket" for the sound library (38GB of compressed material, 58GB once installed, corresponding to 160GB, according to the publisher, who uses a proprietary non-destructive compression format that isn't directly readable), that we launch via the new FX License Manager. The download was pretty slow, maybe due to the number of clients, but certainly not to our Internet connection. The software authorization brought out a couple of problems: while the installation and recognition of files from versions 1 and 2 went smoothly, version 3.0 disregards the validation so the new License Manager starts whenever we run the application or when scanned in Logic. The bug was apparently solved in version 3.0.1.1, which nevertheless added a new problem with the path to the sound libraries of previous versions, hindering BFD3 from starting up in standalone mode... Solution: open BFD3 as a plug-in, deactivate the links to previous libraries under Preferences and rescan all locations. Phew! Once that has been solved we are finally ready to go. The first thing you'll notice is a complete change of look in a way that brings BFD closer to the recent products of the publisher. 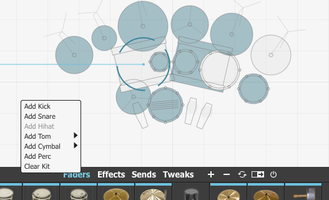 In the screenshot you can see the software's graphic evolution, which offers this time a perhaps clearer navigation and a more logical and fast access to the different options. First good news: the sound library is completely new, with five new kits (DW, Masterworks, Paiste, Zildjian, Tama, Gretsch, Bosphorus, etc., according to seven configurations and playing techniques) and percussion instruments (cabasa, tambourine, hand claps, blocks and cowbell) for a total of 118 instruments and five new articulation types. Second good news: the publisher's previous sound libraries are recognized. 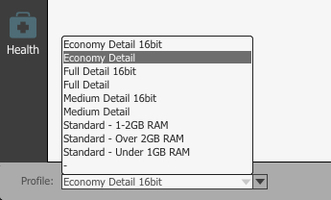 You may have to import some manually, but fortunately there is a Content Locations window with all the necessary tools. The first time you load an old kit or instrument it will go through an update process (indicated by an Upgrading animation on the instrument), but afterwards it will load right away. You should take your time to adjust the preferences because they allow a very effective and precise management of the host computer's possibilities, MIDI responses, shortcuts, diagnostics, etc. If you have BFD2, don't forget to choose this format or you risk experiencing some weird behavior when importing old groove libraries. In the upper toolbar we have the menus, a new, more easily readable and practical main display, the transport functions and the metronome, as well as a second display with information like the tempo, the position in the song (called Track by FXpansion) and more, plus the Master volume. The main screen offers a nice feature when we click on the Dashboard button: we gain access to several more settings to control the AntiMachine Gun feature, which avoids the repetition effect of an instrument, thanks to the Loud (volume variation) and Tone (timbre variation) options. 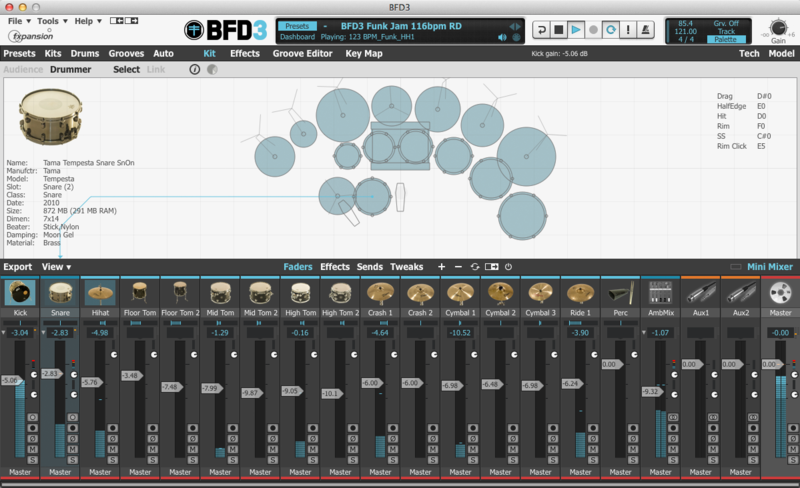 There are also two small boxes to enlarge or shrink BFD3's interface, giving us an almost complete overview of the mixer on big screens, bravo! 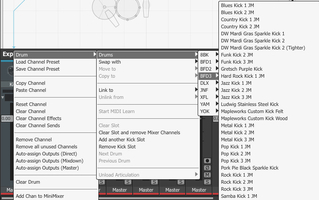 The browser allows us to access the Presets, Kits, Drums, Groove and Auto "pages," without the need of closing the main interface, which is very practical. 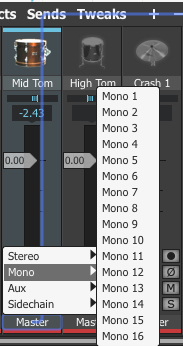 Presets are somewhat different than on previous versions since they now offer the possibility to group all options. Thus, we can choose to include (or not) the kit, the mix, the selected grooves, the mapping of sounds and patterns on the piano, the automation assignations (depending on the chosen host), as well as the global options. In short, we can load with one simple click all conditions to play a complete song (which might come in very handy in live situations, for example). Kits work in the exact same way as in previous versions. But we now have the possibility of displaying only those of a given library, plus there are three elements that can be reset when loading a kit (sound design - Tweaks, channel allocation - Slots and Mixer). 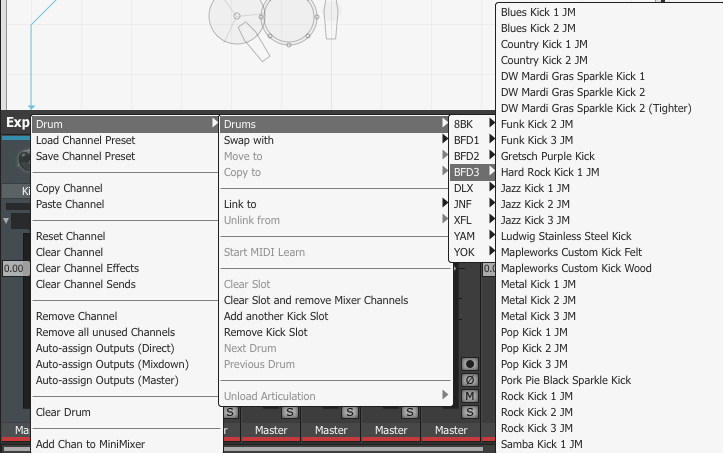 Drums allows us to load separate sounds, with filter per type (kick, snare, etc.). The Processed button allows us to display only the sounds that have been processed, modified both with the Tech and Model options (to which we'll come to later) and the effects. A sort of Channel Preset, which was available in BFD2, but improved. Finally, Auto allows us to match BFD3 parameters to controllers of the host. We can also use a Learn mode with nice tricks, like the Map To Next Free function, that might gain us a lot of time. The Tech and Model pages conceal several new features. While we can find almost straight away most of the functions, parameters and settings to which we are used to, like Trim, Tuning, Bleed (the mic spill from one kit element to the other), activation, volume and ambient mics, there's a new Loudness section. It allows us to adapt the velocity response of the selected instrument with an action rate, a more-or-less linear curve and a restriction for the velocity range. Useful? Not really, because we prefer to keep control over the instrument's response to the playing, unless we want to play everything at full gas. Between the overcompression and the messing with the velocity of virtual instruments, it's about time we leave the dynamics to the musician, being in theory the best judge. In the Model page, apart from improving the way the damping of elements is handled, as well as the choking of sounds (be it manually or by another instrument, due to group management: the open hi-hat being choked by the closed hi-hat is a good example), we have two controls to model behavior at our disposal. The first one is Cymbal Swell, which gives us the possibility to smooth out the response of a cymbal when we do a fast dynamic roll. To that end, it features a rate control, a needle level indicator and presets, if needed. Here's an example on a Paiste 2002 Power Bell Ride, first without and then with Cymbal Swell. Eight notes, at 512 bpm, progressive velocity drawn with Logic's Step Editor's Line tool (formerly Hyper Editor). Conclusive, right? At least much more than without, especially since this type of figure sounds much better played with mallets than with drumsticks. The other tool using modeling is Tom Resonance. It simulates two physical phenomena not necessarily captured during the recording (of the sound samples) and which take place predominantly element per element, most of the time when the unused mics are closed.. So, Res Trim allows us to reproduce the nice resonance of the toms in relation to other instruments, while Spill Trim manages the amount of mic bleed. Here's an example of a kick (a Ludwig Stainless Steel Kick) without and with Tom Resonance set to "normal." Then a more extreme setting with a Floor Tom. An interesting addition to Bleed, which formerly concerned the snare and the bass drum mostly. The fact that it is done with modeling allows us to use the effect with the older libraries (which were recorded without considering this phenomenon) with quite convincing results (within a virtual context we must add...). It would be hard to make a recount of all new features in this article (like the new effects using the DCAM technique: EnvShaper and Distortion, for instance). So, to wrap up this review here are some grooves stemming from BFD3's new offering (rich in signature grooves by Peter Erskine, Steve Ferrone, etc. ), making use of new presets and kits. While BFD3 is no revolution in itself — the concept's foundations were developed with the two previous versions —, it is nonetheless a good evolution of a tried-and-true software. The new kits are very relevant in the history of BFD, which means that they integrate perfectly with the previous models, without making the old libraries absolutely necessary (having them is obviously a plus), but making up for some flagrant deficiencies (brushes, mallets, etc.). And we appreciate the possibility of being able to use libraries of other publishers, including old ones (like Scarbee's SID and DFH/Toontrack's Custom & Vintage). The same applies to grooves developed by Jacques Mathias and Platinum Samples that extend the software's possibilities, without reinventing the wheel. 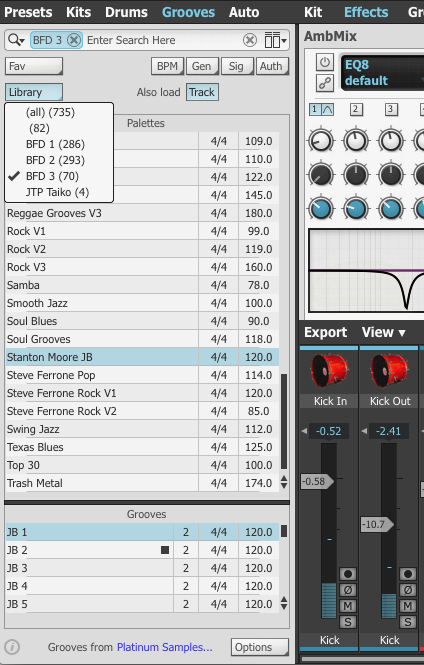 The Groove Editor is a real production machine, sometimes more comprehensive than a DAW's piano roll. The programming shortcuts (flams, rolls and company) are quite amazing. The new reverb is pretty good, even if the algorithms of the BReverb set the bar high enough. And the mixer's improvements and routings are very welcome (especially the idea of tracks being equivalent to sub-groups). The work put into the overall usability and design is also very impressive, making the user experience even more pleasant, without hindering creation with sometimes intricate procedures. We do however regret some instability in standalone mode. 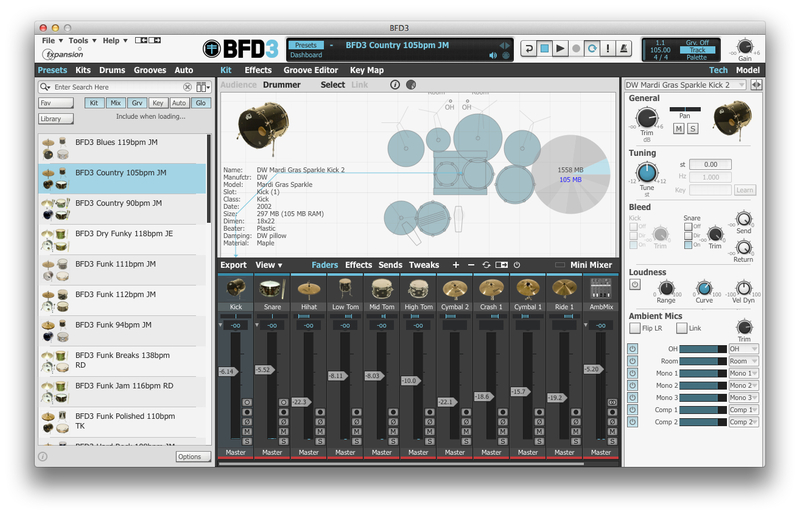 In short, with this third version, BFD remains the most comprehensive and powerful virtual drums/percussion software out there. It is by no means the most intuitive, true (even if it has made great progress in that direction), but it is unmatched in its richness. Well done, mister FXpansion!